I am glad there are 126 riders in this race, but one sure seems to stand out - 22-year old Slovakian Peter Sagan. He won again. 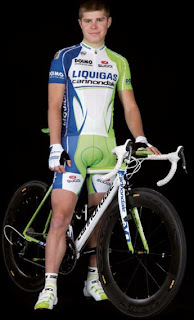 Did you know that Peter Sagan has an older shorter brother who also ride on the Liquigas-Cannondale (Italian) team? You are not seeing double, there are two Sagans )Peter (L) and Jurai (R). Only Peter is racing in California this week, he won the green jersey at the AToC in 2010 and 2011, his odds are looking excellent for 2012. 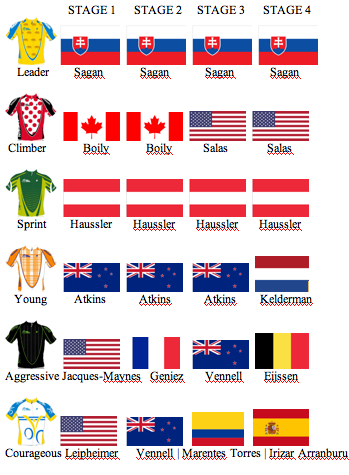 Stage 5 individual time trial is tomorrow, I am guessing Sagan will not win again, but there are no guarantees. 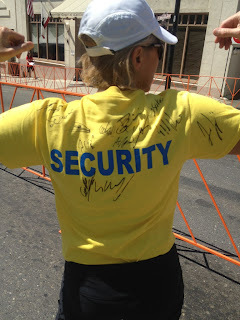 A perfectly good reason to become a volunteer at the Amgen Tour of California is because you might get assigned as security on the steps leading up to the sign-in stage at the start in Sonora. That is what happened to this lucky Volunteer today. Chris happily gathered lots of riders signatures on her tshirt. See you at the race! Individual Time Trial in Bakersfield tomorrow. By the way, any interested citizens will be able to mosey around the course between 8:00-10:00am before the close the route to traffic. The women's ITT starts off at 11:10am, pros at 1:00pm. It'll be hot. 2012 Stage 5, ITT Start List: ﻿TIME TRIAL START LIST 5 - The order of rider for the time trial tomorrow with each riders official start time.